After serving 27 years in the United States Army and sustaining career ending injuries in combat, Gretchen went on her first No Barriers Warriors Expedition. Forever changed by this experience, she joined No Barriers as a volunteer. When not introducing No Barriers to everyone she meets, Gretchen enjoys hiking, biking, running and almost anything outside. 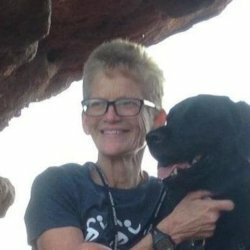 She lives in Asheville, North Carolina with her husband, service dog Aura and beloved family dog Rough Rider.